What is it like to worship in a Lutheran church? Lutheran worship and especially Lutheran hymns and harmonies have a unique flavor that is not matched anywhere else. Worshiping at a Lutheran church is different, but that is good. It is a difference that is marked by being rooted in God's Word and Sacrament and by the rich historic past of the Christian Church throughout the centuries. Lutheran worship is timeless and void of cultural trends. Below is a piece written by Garrison Keillor that summarizes very well what being Lutheran and Lutheran worship is all about. “I have sung with Lutherans and that is one of the main joys of life, along with hot baths and fresh sweet corn. We make fun of Lutherans for their blandness, their excessive calm, their fear of giving offense, their lack of speed, and also for their secret fondness of macaroni and cheese. But nobody sings like them. “If you ask an audience in New York City, a relatively “Lutheranless” place, to sing along on the chorus of “Michael Row the Boat Ashore” they will look daggers at you as if you had asked them to strip to their underwear. But if you do this among Lutherans they'll smile and row that boat ashore and up on the beach! And down the road! “Lutherans are bred from childhood to sing in four-part harmony. It's a talent that comes from sitting on the lap of someone singing alto or tenor or bass and hearing the harmonic intervals by putting your little head against the person's rib cage. It's natural for Lutherans to sing in harmony. We're too modest to be soloists, too worldly to sing in unison. When you're singing in the key of C and you slide into the A7th and the D7th chords, all hundred or more of you, it's an emotionally fulfilling moment”. Worship is more than attending church on Sunday morning. We can worship in many different ways. 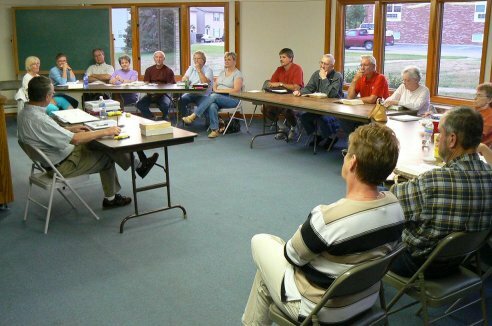 At Trinity Lutheran we offer Bible classes on a variety of subjects. This helps us learn the ‘Word of God’ more fully and completely. Our knowledge of God's Word helps us to worship God with more understanding. We invite all to come and learn more about God's Word. Our studies take place on Tuesday evenings at 7 p.m. in the church Fellowship Hall.